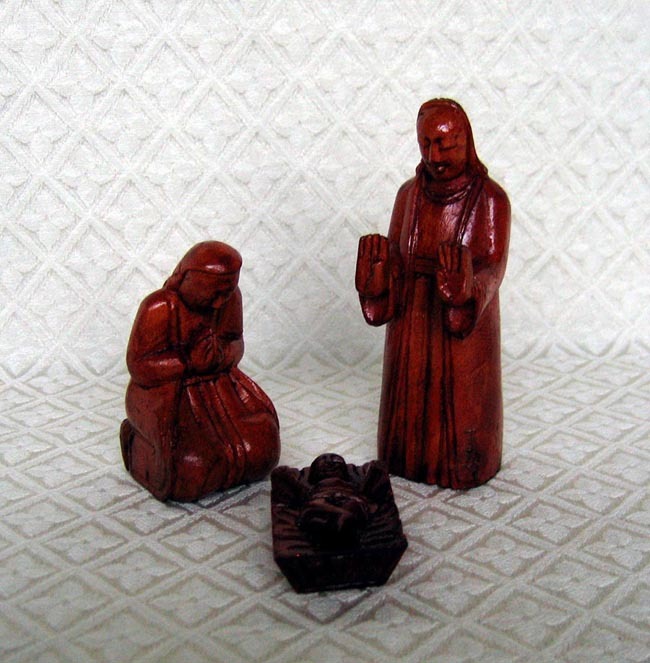 This small Holy Family is hand-carved from hardwood by Suman Shilpakar in Bhaktapur, Nepal. Suman is a Christian artisan by trade. The hardwood is called karma wood in the Nepali language and 'hallu' in Suman’s native tongue. The stain is a burgundy brown. The Joseph figure stands 4.5 inches tall. Traditional Hindu art is mirrored throughout the piece in a blend of Christian and Hindu culture. Joseph’s open palms facing Jesus show a sign of respect in Nepali culture; holding the palms out to someone is a way of sharing your light and spirit with them.